Pala — Bringing the world of gems to your door. For over forty years, Pala International has consistently earned its reputation as the direct source for the finest colored stones. Numerous annual trips to the world’s major gem-producing centers enable Pala International’s staff to select from an impressive inventory. In addition to tapping the world’s resources for fine colored stones, Pala has long been involved with mining tourmaline in San Diego county. Pala International’s slogan is “The only way to sell quality is to buy it.” That, and the fine customer service we offer, make Pala International your number one source for colored stones. Pala International has been in the international gemstone business since 1969 and thus assures your satisfaction. Each gemstone is guaranteed to be exactly as described. 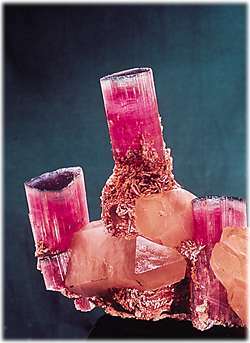 This stunning specimen was mined by Pala at the Tourmaline Queen mine in 1972. Today it is on public display at the Smithsonian Institution in Washington, DC. In 1968, Bill Larson, a connoisseur of quality gems and minerals, formed Pala Properties International (PPI; now called Pala International) and purchased three San Diego County gem mines: the Stewart Lithia, Tourmaline Queen, and Pala Chief. Located in the foothills of northern San Diego county, these mines are part of a local mining history dating back to the 1800s, when tourmaline accounted for the largest percentage of gemstones mined here. American, European, and Asian gem houses were actively involved, including Tiffany’s, which had part-time buyers in the Pala and Mesa Grande mining districts. Even the Chinese were fond of tourmaline, using the gem in oriental carvings and on mandarin clothing. Gemstone production during the early 1900s was recorded in county records as exceeding two million dollars. With the emergence of PPI in the late 1960s, organized mining was on the upswing. Although Bill Larson’s Stewart Lithia Mine produced small pockets of tourmaline, it was not until 1972 that a strike at the Tourmaline Queen produced tourmaline crystals in what was called “the find of the century in terms of color and perfection.” An exceptional piece from that strike called the “Candelabra” is now on exhibit at the Smithsonian Institution in Washington, DC. The International Colored Gemstone Association is an independent non-profit association that was founded in 1983 to represent the international gemstone industry. Pala International is a Founding Member of the ICA. Founded in 1981, the American Gem Trade Association is a group of US and Canadian professionals dedicated to promoting the natural colored gemstone and cultured pearl trade while maintaining the highest ethical standards among its members and within the industry. Pala International is a Founding Member of the AGTA. Pala International is a Registered Supplier of the American Gem Society. The American Gem Society (AGS) has been protecting the consumer since 1934. An association of fine jewelers, its members are committed to the highest standards of business ethics, and practice truth-in-advertising and pricing. The Jewelers Board of Trade (JBT) rates creditworthiness in the gem and jewelry trades. Pala International has been a JBT member for over 20 years and has a 31 (“1st” or “high”) credit rating. The Guide from Gemworld International is the best price guide to gems. Pala is a member of the Board of Advisers, whose members provide up-to-date pricing information to keep The Guide accurate.